It is day two of Holiday Recipe Week, and today I'm sharing a recipe that has become a recent holiday tradition. It has been a little over six years since I was diagnosed with Celiac Disease. I was soon thrown into the world of gluten free food, and was forced to learn how to cook new foods. I had never made meringues in my life, but soon found that they were a great gluten free dessert. They are naturally gluten free, and naturally delicious. 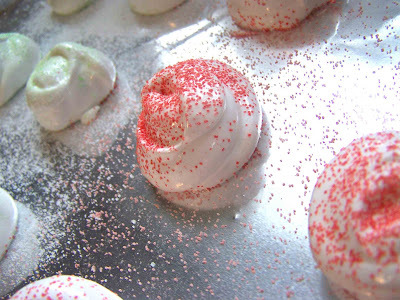 During my first year of diagnosis I stumbled upon this recipe for Merry Meringues (Kraft Foods). They have now become a holiday staple. I often bring this to holiday parties, and they are quickly devoured (by all, not just me). 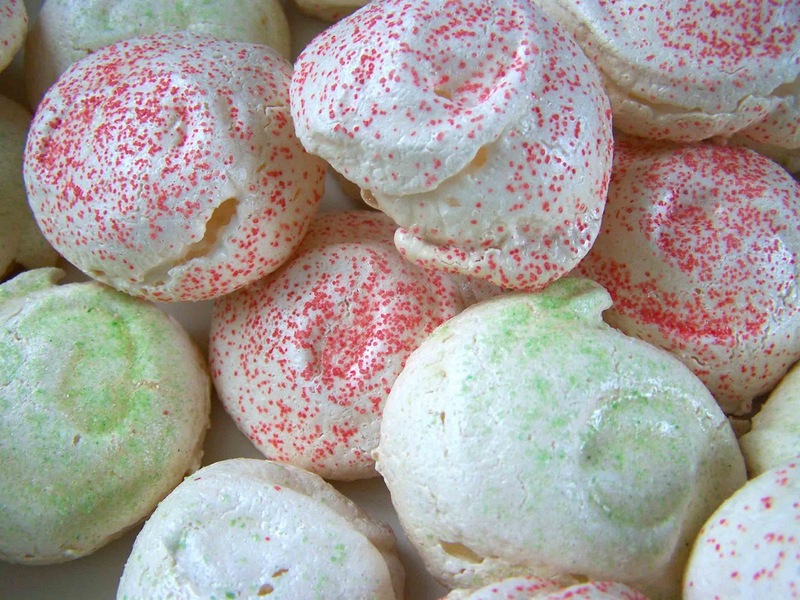 The light flavor and texture of these meringues is always welcomed, when overwhelmed by rich holiday foods. For those of you that have never made meringues, a meringue is formed by beating egg whites, sugar, and a bit of cream of tartar until stiff peaks form. Nuts, chocolate shavings, cocoa, peppermints, ect. can be added to the meringues for a bit of variety. This merry meringue recipe uses dry jello powder to add a bit of flavor and sparkle to the outside of the meringue. 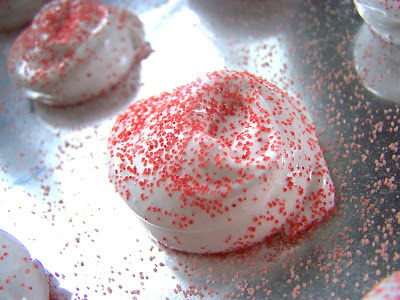 You can use any flavor of jello to customize your meringues for any holiday or season. 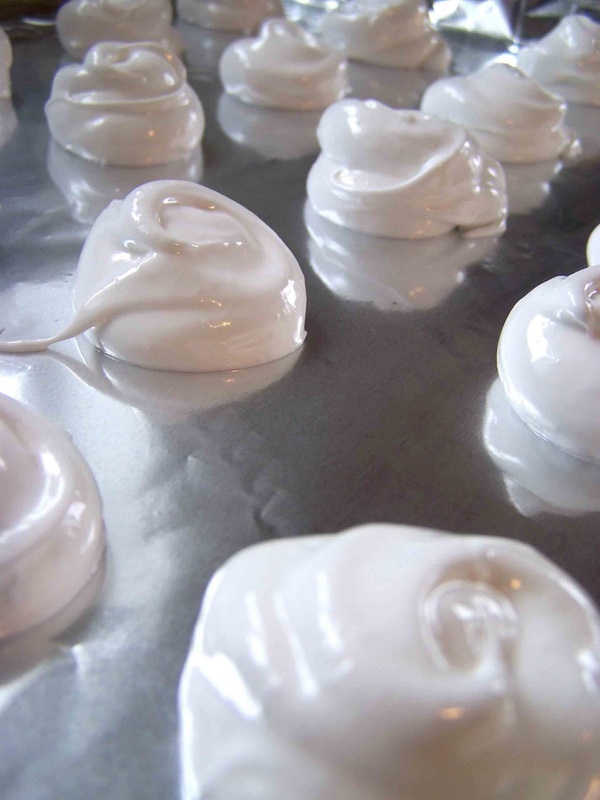 This particular recipe asks you to cook your meringues on parchment paper, but aluminum foil with a very light application of cooking spray will work as well. You can find the recipe for Merry Meringues here. 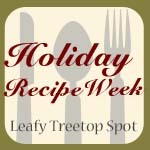 Join in the Holiday Recipe Share. Enter your projects at our link party. In addition to the Holiday recipe share, I'll be linking up here. Very festive! And meringues are such a nice light treat, compared to all the other really heavy treats out there. Meringues are perhaps my favorite sweet in the world! I also have a very close chef friend with Celiac disease and he usually does all the cooking when visiting, It will be nice to surprise him with a new dessert item. thanks for sharing that recipe. They sound terrific and I think I'm going to give them a try!